M. Brewster Smith, professor emeritus of psychology at UC Santa Cruz, whose research and testimony contributed to the landmark 1954 U.S. Supreme Court decision that banned school segregation, died Saturday in Santa Cruz. He was 93. Smith joined UC Santa Cruz as vice chancellor for social sciences in 1970, five years after the campus opened. He served in that capacity until 1975, then continued as a professor of psychology until he retired in 1988. Even after retirement, Smith was an active teacher and researcher. "Psychology has lost a major contributor and statesman," said longtime UCSC colleague psychology professor Thomas Pettigrew. Smith died peacefully after a short stay in the hospital, his daughter Rebecca Garber said. No funeral services are planned. A memorial will be held at a later date. Smith's career spanned more than six decades focused on the interplay of psychological and political processes. In recent years, Smith drew on psychological research to suggest ways to reduce the threat of nuclear war. Although known as a social psychologist, he considered himself a humanistic psychologist who strove to build a humane approach to academics and an academic approach to humanity. In 1952, Smith testified as an expert witness against school segregation in a case before a Richmond, Va. federal appeals court, one of four lower court cases that led to the Supreme Court's Brown v. Board of Education decision. Smith testified that segregation harmed a child's self-esteem, which affected one's ability to learn. He later said he considered his testimony to be among his greatest contributions to society. With two Harvard colleagues, Smith turned his doctoral thesis into the pioneering book Opinions and Personality (Wiley, 1956). He wrote more than 300 other publications, including several books and the 2003 compilation For a Significant Social Psychology: Collected Writings of M. Brewster Smith. He played influential roles in the direction of a number of scholarly journals, including the Journal of Abnormal and Social Psychology and the Journal of Social Issues. Mahlon Brewster Smith was born in Syracuse, N.Y. June 26, 1919, an only child. His father was an English professor who soon became dean at what became Oregon State University, moving the family to Corvallis. At 16, Smith enrolled in Reed College where he stayed for two years before dropping out. He enrolled in Stanford University in 1938 where received his bachelors and masters degrees in psychology. He had just finished the first year of graduate study at Harvard University in 1941 when he was drafted into the Army. Smith recalled that he wanted to delay his service but the draft appeal board met on December 7, 1941. As soon as he heard about the bombing of Pearl Harbor. "Uh, oh, there I go," he remembered. The army put Smith's psychology training to use in testing and interviewing personnel. The work led to his contributions to The American Soldier, a classic psychological study of soldiers in combat. Smith rose from private to major and received the bronze star before re-enrolling at Harvard. A youthful flirtation with radical student politics and the Young Communist League while at Reed in Portland in the mid 1930s, led him to be subpoenaed in the 1950s by the "Jenner Committee," the U.S. Senate counterpart of the House Un-American Activities Committee. The National Institutes of Mental Health blacklisted him for 10 years, he later learned. In "McCarthyism: A Personal Account" in the Journal of Social Issues (1986), Smtih wrote that he and his friends "began to see things differently" and cooled to the communist movement in the late '30s. However, he never lost his activism, arguing in recent years for research that addresses contemporary social issues and advocacy based on psychological analysis. Smith earned his Ph.D. at Harvard in 1947 and joined the faculty as an assistant professor. He subsequently was on the faculty of Vassar College, New York University, UC Berkeley, the University of Chicago, and UCSC. At UC Berkeley, in 1961, Smith was instrumental in interviewing and qualifying the first cohort of Peace Corps volunteers. He later took two trips to Ghana to visit them and stayed in touch with many for the rest of his life. Throughout his career, Smith was active in many governmental and professional organizations. He was president of the Society for the Psychological Study of Social Issues (SPSSI) in 1958-1959; the American Psychological Association (APA) in 1978; and of Psychologists for Social Responsibility in 1987. He served as department chair at Vassar and Chicago, director of graduate training at NYU, and director of the Institute of Human Development at Berkeley. He won the Kurt Lewin Award in 1986, the most prestigious honor in social psychology; the APA Award for Distinguished Contributions to Psychology in the Public Interest, 1988; the first Lifetime Service Award bestowed by the Western Psychological Association, 1996; and the SPSSI Distinguished Theoretical and Philosophical Contributions to Psychology, 2006. 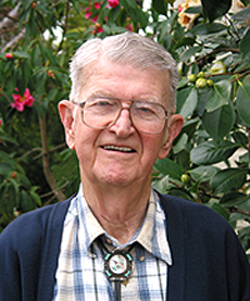 At UCSC, he received the 2010 Distinguished Social Sciences Emeriti Faculty Award. He is survived by his wife of 64 years Deborah of Santa Cruz; sons Joshua Smith of Seattle; Dance Smith, of Tacoma, Wash; Torquil Smith, of Berkeley; daughter Rebecca Garber of San Diego; and five grandchildren. In lieu of flowers, the family prefers donations to UC Santa Cruz where Smith supported scholarships and many programs.